Led by three MBA2s, the Stern Energy & Infrastructure Club presented a comprehensive overview of the trends, players, and business models that exist in the space. 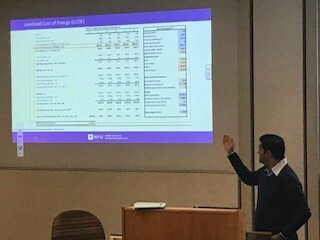 Students with experience in Power & Utilities, Renewables, Oil & Gas, and Infrastructure gave current MBAs a high-level summary of everything from OPEC’s role in the global marketplace to the increasing need to renew the nation’s aging infrastructure. Armed with this introductory-level knowledge, students are better equipped to tackle energy and infrastructure specific interviews this fall and spring. The club would like to thank Greg Gangelhoff, Arnab Khasnobis, and Jonathan Kienzle for their contributions to the event.